Most of your customers like buying from you. Some LOVE you. And some…well you can’t please them all. But are your customers happy ENOUGH? Have they been getting happier over time? Or could your product or service quality be slipping a bit? How do you know for sure? Ask them to answer on a scale of 0 (not likely at all) to 10 (extremely likely). There’s a TON of research behind why this is the ONE question you need to ask. I’ll spare you the details, but it boils down to this: If people are going to stake their reputation and recommend you, you’re doing great! If they won’t, then you’ve got some work to do. You now know how to measure each customer’s satisfaction, but how do you get the “average” happiness for your customers? Warning: You can’t simply take the average! Why not? Because different customers behave very differently. There are three types of customers. “Passives” are satisfied but unenthusiastic. 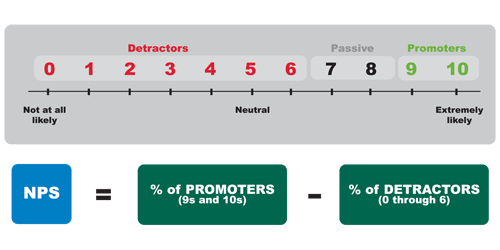 The average company has a NPS score of only 5 to 10, meaning barely more promoters than detractors. The best companies enjoy NPS scores of 50-80 percent–companies like Amazon, Harley-Davidson, and Costco. And it’s no surprise that these companies excel at both customer satisfaction AND revenue growth. A small business should be able to do better than average, because you know your customers more intimately. Target a minimum of 30. Time to measure YOUR Net Promoter® Score! It’s easy. Survey your customers–place survey cards by the register, include a survey when you send an invoice, or just start your next newsletter with a quick 3 minute survey! In addition to asking the NPS question, be sure to allow open responses to get more detailed feedback. Next, make it a habit! Every month, or every quarter, repeat the survey. Track how your NPS is trending over time, for extremely valuable insight into how your product/service quality is trending! Track the trend on your management dashboard. Sources: Satmetrix Systems, Bain & Company.